SOLIDWORKS PDM Professional manages and synchronizes your design data across your entire product development team with a single, easily deployable solution tightly integrated with all SOLIDWORKS applications. By leveraging a secure vault, you can extend access to your 3D design environment and associated files to all participants from engineering through manufacturing, both locally and remotely. Everyone involved in your projects can share information and collaborate on designs while automatically protecting intellectual property with version and revision control systems. Need a comparison of all our PDM and Project Management tools? Take a look at the PDM Pro vs. SOLIDWORKS Manage matrix. Easy to set up and use, SOLIDWORKS PDM Professional automatically captures file revision histories automatically and allows you and other members of your product design team to instantly access desired files, determine who has worked on them, and see exactly when changes were made. SOLIDWORKS PDM Professional helps your design team more efficiently manage all types of design information—both documents and data—including properties such as description, status, number and costs. Immediately get up to speed through a fully integrated bundle that includes database software, CAD connectors, replicated servers and an API for customization. Realize an immediate return on your investment by launching SOLIDWORKS PDM Professional in just days, then scale it as your organization grows in people, partners, and geography. By making all of your product design files and data available in a manageable and secure environment with fast search capabilities, SOLIDWORKS PDM Professional allows your design team to access content easily and to reuse previously developed design work more efficiently. SOLIDWORKS PDM Professional uses an intuitive graphic interface to help you map workflows and minimize administrative work, while automated tracking of approvals and sign-offs maintains accuracy and accountability. View a SOLIDWORKS product matrix to compare SOLIDWORKS PDM and SOLIDWORKS Manage packages. 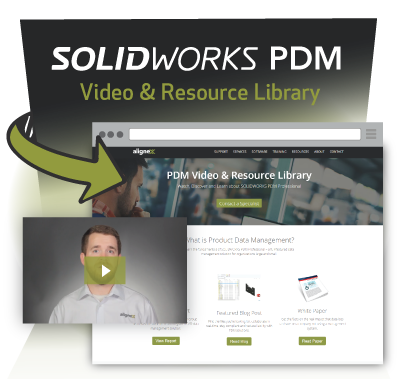 Explore SOLIDWORKS PDM technical videos from our experts, industry white papers and more.